ESPN’s Adam Caplan reports that Philadelphia Eagles running back Wendell Smallwood is expected to miss the team’s Week 5 game against the Arizona Cardinals. Smallwood injured his knee in Week 4, and missed the entire week of practice. Smallwood has played 108 snaps so far this season, the most among Eagles running backs. 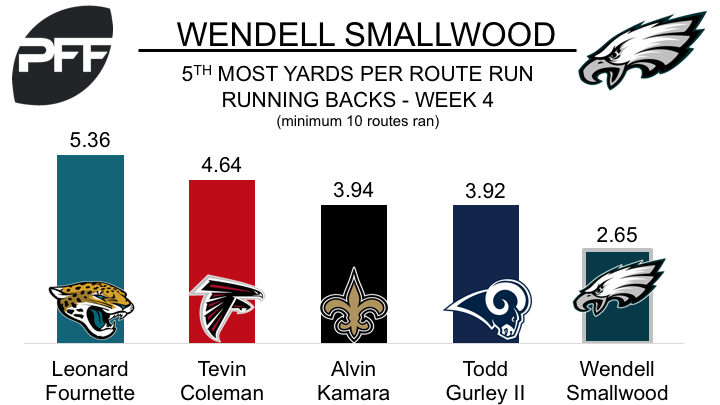 He is currently ranked 35th of 38 qualifying running backs with a PFF overall grade of 62.4. With Darren Sproles lost for the season with a torn ACL and a broken arm, Smallwood took over as the team’s third-down back in Week 4, and performed admirably, catching all four of his catchable targets for 45 yards, two first down conversions and an average of 2.65 yards per route run, which ranked fifth among the 21 running backs that ran at least 10 snaps in route. He also added 34 rushing yards on 10 carries, with all of those yards coming after contact. If Smallwood is indeed ruled out for the game, the Eagles will be leaning on LeGarrette Blount and rookie Corey Clement to handle the load out of the backfield. Last week, Blount put on a masterful performance against the Los Angeles Chargers, where he racked up 136 yards on 16 carries, forced nine missed tackles and averaged a colossal 8.00 yards after contact per attempt.